The BEST Deluxe Table Top Easel is designed for reliability and durability. This table top easel can be used with the BEST Terrero Taboret or on a flat surface by itself. 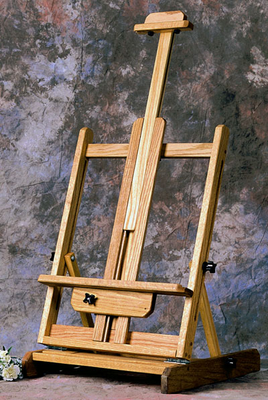 Like several other BEST easels, this one is constructed from sturdy American Red Oak. 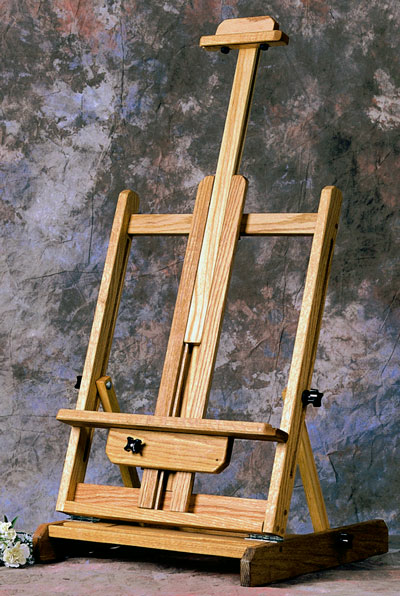 The easel can be folded for easy storage and is an excellent easel option for art schools or art instruction. The slide guides are easy to use and the simple but intuitive design makes this easel a great option for any instructor, professional or art student. Easel width x depth: 18" x 18"
3.6 out of 5, Based on 3 Reviews. Quality is disappointing. Too many very different grains of wood. For the price I expected more consistency. The easel is not sanded well and has scratches in many places and a few knicks. I expected so much more from BEST. I would not purchase this product again. Excellent product with no assembly required that arrived well packed and on time. Additionally, the price beat the competition! Can one ask or expect anything more? Would recommned this product without reservation. So far, so good! I have only had it for several days, but it is made well, solid construction, holds the canvas in place.